These CANDY CORN JELLO CUPS are an easy make-ahead treat that’s perfect for Halloween parties or as a special fall snack! Halloween is one of my favorite times of the year, especially now that I have three little trick-or-treaters of my own. I’m always looking for ways to make the holidays special without a ton of extra work. 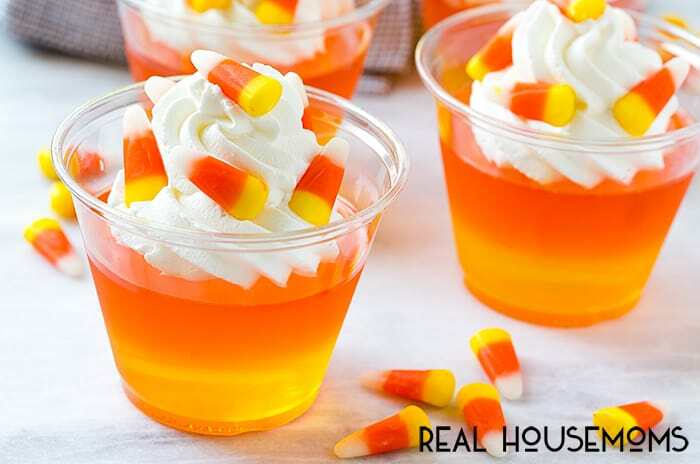 These candy corn jello cups are super easy to make and look adorably festive! This recipe is simply a layer of yellow jello, a layer of orange jello, and whipped cream to create the colored layers of candy corn. Real candy corn is sprinkled over the top for the finishing touch. I used disposable clear plastic cups to hold the jello. My cups were 9-ounce size, but you could probably go a little smaller if you can’t find the 9 ounce size. It’s important to take the time to let each layer of jello set completely before you add the next color, otherwise you risk the colors running together. 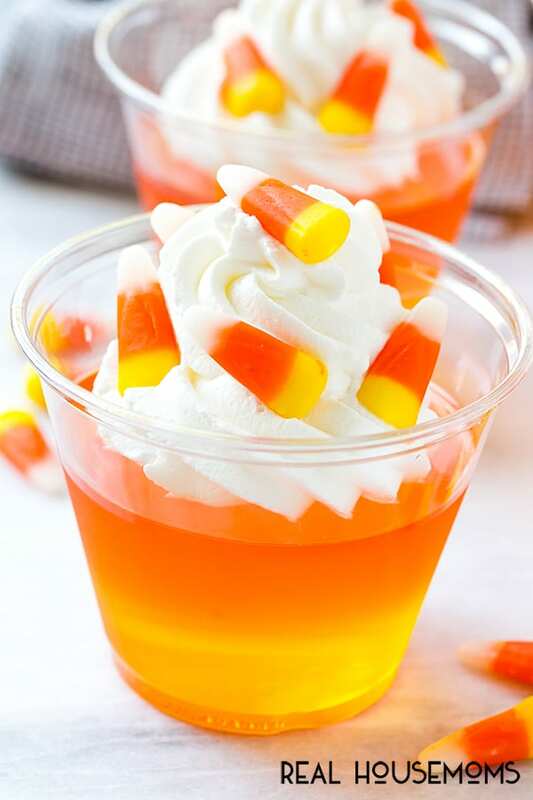 The great thing is the orange and yellow jello layers can be made up to 3 days in advance; simply add the whipped cream and candy corn right before serving. 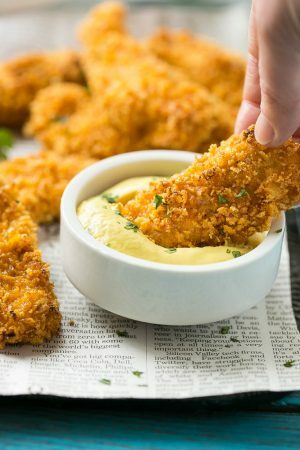 This is a really fun activity to get the kids involved with too! I used homemade sweetened whipped cream piped onto the tops of the cups with a star tip, but you could also use canned whipped cream or simply a dollop of thawed whipped topping if you prefer. 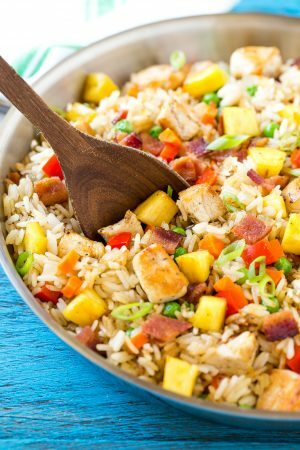 The colorful candy corn on top add a fun burst of sweetness and texture to the mix. 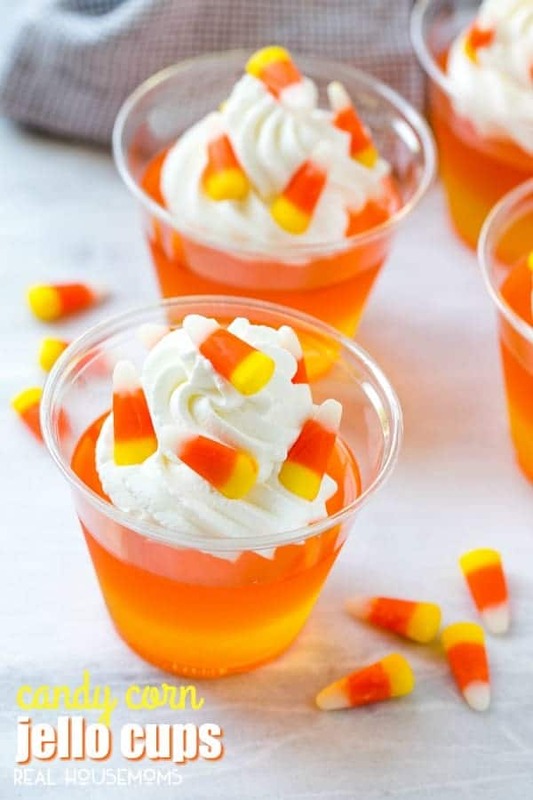 I am planning to make these candy corn jello cups for my daughter’s Halloween party at school, I know that the kids will love them! The adults will love them too, there’s just something irresistible about layered jello treats! These candy corn jello cups are an easy make-ahead treat that's perfect for Halloween parties or as a special fall snack. Place 2 cups of water in a medium microwave safe bowl. Place the bowl in the microwave and heat until the water is boiling, approximately 2 minutes. Remove the bowl from the microwave and pour in the packet of yellow jello. Whisk until the jello has dissolved. Add 1 cup of ice and stir until ice has melted. Pour approximately 1/2 cup of yellow jello into the bottom of each cup. Place the cups in the refrigerator and chill until the jello is completely set. Remove the bowl from the microwave and pour in the packet of orange jello. Whisk until the jello has dissolved. Add 1 cup of ice and stir until ice has melted. Pour approximately 1/2 cup of orange jello on top of the yellow layer. Place the cups in the refrigerator and chill until the jello is completely set. Top each jello cup with 2 tablespoons of whipped cream or whipped topping. You can place the whipped cream in a piping bag fitted with a star tip or simply add a dollop with a spoon. 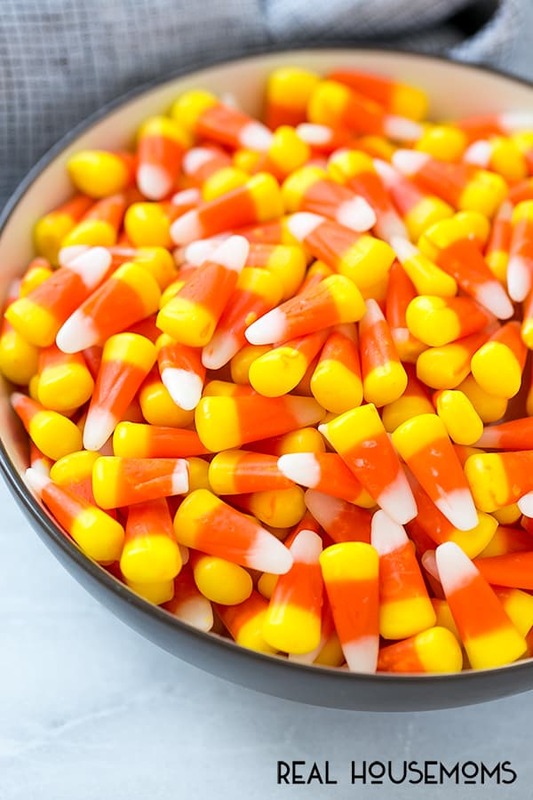 Sprinkle 1 tablespoon of candy corn over the top of each cup and serve immediately.